Keeps us dry and comfortable in rain, sleet or snow. Pet umbrella leash attaches easily and quickly to pet's collar. 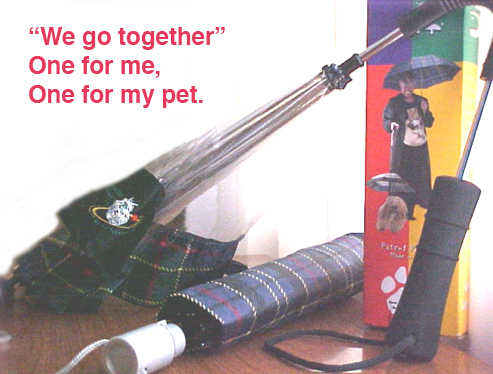 Pet umbrella has an ergonomic angled handle with padded comfort grip. Pet umbrella's clear body gives you full view of your pet. My umbrella folds to 15", opens to full size and opens with a push of a button. Donated by Sugarbear.......Thank you very much! Please note: Buyer will send a check for winning bid made out to IGCA Health Fund. will provide a link to a web page with PayPal Buttons. Clicking the Bid button should bring up your configured mail program with the subject line already filled in. If this fails, please follow the "manual email" instructions on the right. 2. Your name as you would like to see it posted as "High Bidder". 5. If you are placing a bid for someone without internet access, please include that person's name and contact information. This item is still available. Please contact Carmela Ciampa with questions or concerns about this site.